Overview - When young Ofelia and her mother go to live with her new stepfather on a rural military outpost, she finds herself caught in a world of unimaginable cruelty. Armed with only her imagination, Ofelia discovers a mysterious labyrinth and meets a faun who sets her on a path to saving herself and her ailing mother. But soon, the lines between fantasy and reality begin to blur, and before Ofelia can turn back, she finds herself at the center of ferocious battle between good and evil. Writer/director Guillermo del Toro loves to explore the dark. Whether he's tackling evil at its essence in a popcorn flick like 'Hellboy' or looking into the shadows of the real world with a ghost story like 'The Devil's Backbone,' del Toro is a master storyteller. Nominated for Best Foreign Language Picture at last year's Oscars, 'Pan's Labyrinth' tells an intimately frightening fairy tale that examines the cruelty of a child's world and delves into the chilling recesses of the imagination. In 1944 post-Civil War Spain, a young girl named Ophelia (Ivana Baquero) travels with her pregnant mother to live with her new stepfather, the detestable Captain Vidal (Sergi Lopez). Vidal is a merciless officer in the Spanish army whose troops are scouring the countryside for a band of anti-fascist rebels. While waiting for the birth of her half-brother, Ophelia is mysteriously drawn into an old-world labyrinth where she meets a decrepit creature twisted by time. This faun (played by Doug Jones) tells her she's actually a long-lost princess from an ancient, underground kingdom. To regain her rightful throne, Ophelia must face a series of monsters -- a giant toad, a horrible beast called the Pale Man (also Doug Jones), and, inevitably, the cruel Captain Vidal himself. When I first watched 'Pan's Labyrinth' in theaters, I was initially surprised by how much of the film is grounded in the realities of our world. The faun, the fairies, the toad, and the Pale Man comprise less than thirty minutes of screen time over the course of the two hour film. For the most part, del Toro keeps his camera focused on Ophelia's home life as her stepfather searches for spies in the hills. The story evolves into a modern fairy tale in every sense of the term because it never defines the truth of its tale. 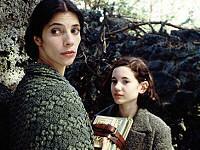 Is del Toro's film the story of a girl who stumbles onto a genuine quest to discover her identity? Is it a thoughtful examination of the death of innocence during adolescence? Is it a cold cautionary tale about monsters in our midst? Or is it simply about a child escaping into her imagination to cope with the brutality of her surroundings? Regardless of your interpretation, 'Pan's Labyrinth' is a masterwork of bleak fantasy that forces its viewers to question the very nature of good and evil. 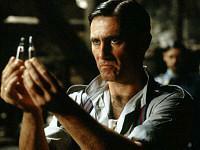 The actors completely inhabit del Toro's subtle script with every expression and nuance of their performances. The angel-faced Baquero portrays Ophelia as a soft-spoken victim of circumstance who’s painfully familiar with her world, Lopez single-handedly crafts one of the most terrifying villains in cinematic history, and Jones makes his other-worldly creatures seem distinctly grounded in reality. The rest of the supporting cast is also packed with devastatingly authentic performances from established Spanish-speaking actors (Maribel Verdu chief among them). By the end of the film, del Toro has effectively melded their work into a perfectly-paced story that's both heartbreaking and rewarding. If I have any slight problem with 'Pan's Labyrinth,' it's that its fantasy world isn't a more centralized element of the film. While I wouldn't have wanted del Toro to cut one second of the wartime drama, I do wish there was an additional half hour of footage that fleshed out the cavernous dwelling of the giant toad, the creepy halls of the Pale Man, and the questionable motives of the faun and his fairies. I know it would make 'Pan's Labyrinth' a two and a half hour flick, but it would be worth it in my opinion. As a fantasy film, 'Pan's Labyrinth' is a haunting piece of evocative cinema that taps into the darkness inherent in every classic fairy tale. As a war film, it creates an evil force that's more threatening than the most terrifying storybook visions. As a whole, 'Pan's Labyrinth' defies genre conventions and delivers a spectacular tale of childhood innocence and our frightening confrontations with the real world. 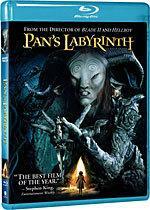 'Pan's Labyrinth' arrives on Blu-ray with a 1080p/VC-1 transfer (identical to the HD DVD) that dazzles the eye as effortlessly as the film haunts the imagination. Colors are rich, the palette is painterly, and bold reds leap off the screen. Even the bleak labyrinth scenes are bathed in gorgeous blue tones that offset the warmth of the intentionally oversaturated skintones. Del Toro's darkest shots creep up and overtake Ophelia, flooding the picture with well-delineated shadows that never obscure the detail of the cinematography. Despite a wide variety of lighting schemes, contrast is consistently perfect, black levels are intense, and there isn't a hint of source noise, artifacting, or meddlesome edge enhancement. Detail is outstanding as well. I continually found myself pausing the film at random moments to inspect rocks, tree leaves, and clothing fibers. Take a look at the forest during daylit scenes, the stonework at the bottom of the faun's spiral staircase, and the lavish realm of the Pale Man. Character close-ups and wide long shots are nice and crisp -- tight shots of Captain Vidal reveal every crevice and developing wrinkle. Facial textures are a bit waxy at times, but it isn't distracting. Likewise, the film's CG creatures look more at home in this transfer than they ever have before. I thought the film's digital effects looked somewhat disjointed from practical elements in the film’s theatrical run and on DVD, but they look exceptionally naturalistic here. On that note, a word of warning for purists -- grain has been artificially reduced using a minor application of Digital Noise Reduction (DNR). Because this decision by New Line has sparked some controversy, I spent quite a bit of time comparing this Blu-ray release to the previously released high-def import edition, hunting for blurry patches of skin and smeared textures. My takeaway: fans with screens larger than 100" may see a loss of clarity when directly comparing still shots from this domestic version to the same shots on the import, but the vast majority of viewers will never notice or care (especially considering how insignificant the visible difference actually is when the film is in motion). While I'm not a personal fan of New Line's unnecessary adjustment of the original print, I feel it's crucial to note how judiciously the technique has been applied in this case. All things considered, 'Pan's Labyrinth' is a great looking addition to your Blu-ray library that puts the standard DVD editions to shame. The transfer may not be as natural as the very best top-tier high-def releases, but it comes incredibly close. Fans aren’t likely to be disappointed. Though there’s likely to be an ongoing debate over New Line’s use of DNR on this title, the film's Spanish DTS HD Master Audio 7.1 surround track is inarguably exceptional. Simply put, this mix is all about dynamics and immersion. The rear speakers rarely rest, populating the quietest scenes with the ambient hum of insects in the wind-swept forest. As tension mounts, the LFE channel pulses with powerful bass tones while the rear soundscape introduces the eerie melodies of the score. When violence inevitably erupts, the track goes for the jugular -- the floor rumbles, each speaker swarms with aggressive effects, and screams are clear and stable. Interior acoustics are spot-on, directionality is perfect, and channel movement is smooth. More importantly, dialogue is crisply balanced across the front channels and well prioritized even in the midst of chaos. I legitimately felt as if sounds were occurring from other sources in my home theater; an illusion I usually only encounter at my local multiplex. Each time I closed my eyes, I found myself transported to another world -- the track is that convincing. There are countless showcase scenes, but none are more immediately successful than the Pale Man confrontation. Listen as Ophelia approaches the banquet table. Notice the acoustics of the stone hall as the creature cracks to life? Hear the chilling tones of its raspy cries? The frenzy of its desperate chase? Ophelia's shallow breathing as the entranceway closes? I have to say, this is only one of a few tracks I've reviewed in which every element that should exist within the soundfield is present and exactly where it should be at all times. All in all, 'Pan's Labyrinth' provides a standout experience that's a step above most other Blu-ray tracks. The Blu-ray version of 'Pan's Labyrinth' includes all of the supplemental material that appeared on the 2-disc Platinum Series DVD (plus a nice HD exclusive, which I'll discuss in the next section). While the supplements are presented in standard definition, they're comprehensive enough to make up for the oversight. Director's Prologue (SD, 1 minute) -- Things kick off with a quick introduction to the film from del Toro that sets the tone for what's to come. Director's Commentary -- Writer/director Guillermo del Toro pays a lot of respect to his cast and crew, but quickly reveals he's a storyteller at heart. He establishes details about the project's development, scripting, and pre-production before he delves into the actors and on-set atmosphere. Descriptions of key shots are thoroughly engaging -- he points out things I hadn't noticed before and offered insights into the tale I hadn't considered. His observations get a bit technical during the film's third act, but he keeps things suitably interesting. Fans of the film and the director's work shouldn't miss this one. The Power of Myth (SD, 15 minutes) -- A fascinating featurette that examines the classic fairy tales that inspired the story, creatures, and set pieces in the film. Pan and the Fairies (SD, 31 minutes) -- This subtitled documentary explores the creature effects, make-up, costumes, and CG work used to give 'Pan's Labyrinth' its unique look. Fans of the faun and the Pale Man designs should be enthralled to see their creation and practical application on actor Doug Jones. The doc also includes behind-the-scenes footage of Captain Vidal's cheek wound, the toad, and other intricate beasties. The Color and the Shape (SD, 4 minutes) -- This is an all-too-brief featurette that focuses on the film's cinematography and tone. Worth a watch, but it doesn't offer much weight to the making-of material. The Lullaby: The Melody Echoes the Fairy Tale (SD, 5 minutes) -- I'm still waiting for a feature length examination of a film's music on a home video release. This short two-parter looks into the brilliant score but it ends just as things get interesting. The Charlie Rose Show Excerpt (SD, 50 minutes) -- Featuring a roundtable chat with Mexican directors Guillermo del Toro, Alfonso Cuaron ('Children of Men'), and Alejandro Inarritu ('21 Grams') this fast-paced interview doesn't focus specifically on 'Pan's Labyrinth,' but it still has a lot to offer fans of the film. The Director's Notebook (HD interactive pages/SD video content, 18 minutes) -- This interactive feature allows you to click on icons which lead to seven mini-docs about various aspects of the production: Lost Character: El Hombre de Madera, Torture of the Maquis, The Phases of the Moon, Iconography, Echo Echo, The Underground Kingdom: Miniature Construction, and The Mill: Set Design. Storyboard Comparisons (SD, 6 minutes) -- A collection of scenes feature del Toro's hand drawn sketches in the top left quarter of the screen, the finalized storyboards in the top right, and the final film in the bottom half. VFX Plate Compare (SD, 2 minutes) -- Perhaps the most insignificant of the special features, this aimless video shows del Toro performing a lighting test with a prop fairy for the effects crew. The final scene is simultaneously shown to the right of the test footage. Comics (SD, 4 minutes) -- Four non-interactive animated comics tell minor stories about the faun, the fairies, the Giant Toad, and the Pale Man. They're too short, but they do offer several interesting tidbits for fans -- one gives a synopsis of how the faun came to dwell where Ophelia finds him, while another reveals the fate of the Pale Man after Ophelia's escape. Photo Galleries -- An extensive collection of high-def production stills, design sketches, and scrapbook photos from the film. Marketing Campaign Materials (SD, 6 minutes) -- This section includes the film's theatrical teaser, full trailer, 7 television spots, and a gallery of poster images. 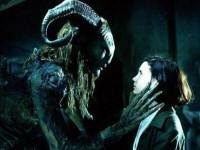 'Pan's Labyrinth' is a fascinating film that will continue to linger in the shadows of your mind long after you view it. This Blu-ray edition is excellent as well, featuring a striking transfer, a jaw-dropping DTS HD MA audio track, and a wealth of supplemental content. It even has an exclusive PiP commentary to sweeten the pot. I can't recommend this Blu-ray release enough.